The Security Council’s veto powers’ were a point of contention at the United Nations General Assembly. Reform initiatives were discussed for a more proportional representation. Currently, veto powers are limited to the Permanent 5 countries and winners of World War II: Russia, the U.S., China, the United Kingdom and France. France maintained that they previously motioned to decentralize authority to veto, but that they lacked Russia and the U.S’s support. 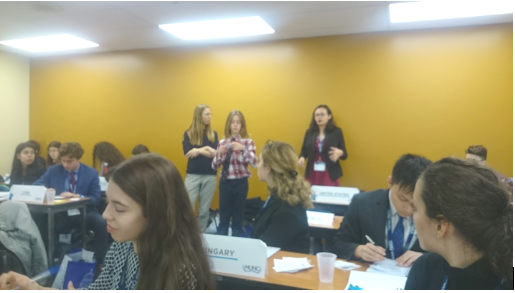 The delegate of the United States of America posited that they were “open to accommodation.” They posited that they were against the restrictions of vetoing to the P5 countries. They shared their interested in wanting to achieve proportional representation for nations. Venezuela claimed “the U.S does not want to relinquish power.” The delegate from Venezuela asserted its intention to “reinstate democracy,” so that all nations would be equal before the law. Venezuela claims “no nation, however rich, large and armed, should bully another” and pushed for the motion to inspect the Eurocentrism inherent in veto powers. The U.S. says that they were misquoted. Their veto power was earned and deserved in its incessant aid to other nations. The delegate of the UK continuously motioned to discuss Russia’s historical vetoing uses. The motion was tied after 3 re-votes. The Russian Federation immediately postulated that in case of a tie, the motion fails. The delegate of Spain then walked back into the room. Their vote had not yet been taken into account. After a few moments of silence, Spain voted against the motion. Venezuela reaffirmed that it will not comprise for democracy. Having been threatened with nuclear weapons, Venezuela claimed “equality is not the status quo”.